Put that way, it sounds reasonable enough. The only problem is that it has no real connection to the crisis of 2008 and would almost certainly have no role in preventing credit cycles, of which the crisis was a manifestation. This irrelevance is presumably why it was not included in the mammoth financial regulation bill making its way around Congress. Consider the fundamentals. There was an extreme credit and real estate cycle. Markets always cycle, but this one was gigantic because it was fueled by government policy, both the Federal Reserve’s bubble blowing and the encouragement of home buying by Congress, acting through Fannie Mae and Freddie Mac. When the bust came, it brought down mortgage firms and old-fashioned commercial banks that had given loans secured by property—property prices fell below the value of the loans. Investment banks were caught with securitized mortgage pools, which lost immense amounts when marked to market in the midst of a meltdown where nobody wanted to touch them. Ironically, now they’ve become popular investments! All this may have caused losses at bank prop trading desks, hedge funds and private equity funds, but those were minor compared to the losses from real estate-related securitization operations and loans. Plus, outside investors took most of the hit. If Bear Stearns had sustained losses only in its two hedge funds, it would have had a reasonable chance of surviving. Now, there is an entirely different reason to break these activities from banks, which Volcker trots out without making a distinction from the “avoid additional layers of risk” argument. An investment bank’s own traders might take advantage of the knowledge within the company of what the brokerage customers are doing. Traders complain that bank prop desks have an unfair advantage. There is a potential conflict of interest. This issue has been around for many years and has no bearing on crisis-causing risk. Traders have the option of going to a brokerage that does not trade on its own—indeed, there are brokers who use not trading as their selling point. By Volcker’s own admission, prop trading by banks is not widespread. He writes that “only a handful of American mega-commercial banks, perhaps four or five” engage in the speculative activities. Moreover, the revenue derived from trading is a small component of total revenue. Goldman Sachs (GS), the big player, gets 7% of its annual revenue from the activity, which accounts for only 1% to 3% of other banks’ revenues. Nevertheless, some folks would make a great deal of money if they took over the lucrative trading business, say, of Goldman. It is hard not to suspect that an interest group must be lobbying behind the scenes to include a ban on prop trading in the financial regulation bill. 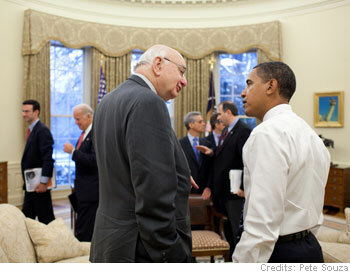 The two rationales given by Volcker – avoiding additional risk and potential conflict of interest – are the presentable reasons. But there is also a less respectable effect: any such measure will re-distribute profit opportunities. This third aspect is the one you don’t hear about. The problem isn’t bank size or bonuses. It’s that our US Treasury has been looted by our own government. The problem is the incestuous relationship Goldman Sachs and the Feds. Geithner, Head of the US Treasury, appointing Mark Patterson, a Goldman Sachs lobbyist, as Chief of Staff! Goldman came out the biggest beneficiary in the AIG $180 Billion bailout, along with zero oversight of their secretive hedge funds, accounting practices, and hidden foreign accounts.